Keep the poles slightly angled back. Ski walking is not a hand above your heart type of exercise. Your hands and feet work opposite – when you lead with your right foot, be sure to lead with your left hand (just like regular walking, running and cross-country skiing). Keep your fingers loose and relaxed. The pole plant is NOT out in front of you – it is only as far forward as the heel of the opposing foot (plant the right pole tip in line with the heel of your left foot). Keep the poles angled back behind you. Let the fancy straps do the work – don’t squeeze the poles. As you become more comfortable start to “push” off a little after every pole plant – putting the pressure from the heel of your hand into the cradle of the strap. Remember that there is a pole plant with every heel strike – left pole with the right heel and right pole with left heel. Don’t swing your poles out in front – wrong/bad. Keep the rubber tip or metal tips behind you – even as your hands move forward. Ideally, the poles are always angled slightly behind at all times, unless you have a balance issue. Casually walking, trekking and hiking with the poles is healthy and good – burning over 20% more calories than regular walking! Remember to keep your chin up, fingers relaxed and poles slightly angled back. Each pole plants inline with the opposing foot’s heel – alternating and never out in front unless going down a steep hill. When done correctly you will immediately notice your improved posture – walking taller and with a straighter back, automatically, without having to think about it. If you notice one or both of your rubber tips slipping be sure to practice on the grass with the rubber tips off – using the metal tips. Continue to keep those fingers relaxed – DON’T grip the poles. Take advantage of your comfortable Nordic Walking Straps – patented by the Salomon Ski Company. Feel the pressure from the heel of your hand distributed effectively into the cradle of the strap versus squeezing and gripping the poles. Punch the rubber Nordic Walking tips/asphalt paws into the road/walking surface with a firm pole plant – in sync with the opposite heel. This additional punch will beef up the effectiveness of Level 1. Remember – fingers relaxed and NO white knuckling! Requires the arms to fully stretch out and slightly down, keeping the poles slightly less angled back and almost perpendicular. This full arm extension will help to burn over 30% more calories than regular walking! You will find that your walking pace will speed up and your stride will naturally lengthen. Never fake a long stride – allow it to happen naturally. Keep your chin up and fingers relaxed! Shifting from Level 1 to Level 2 is like shifting gears in a car. Level 2 reinforces improved walking posture when done correctly. Again, the poles are NEVER planted out in front of you. Never in front of the lead heel. A little punch goes a long way. Utilize that full arm extension and combine it with a nice little punch – punch the rubber tip into the walking surface while keeping the fingers relaxed and NOT gripping the poles (pressure from the heel of your hand into the cradle of the comfortable patented straps). Includes a full reach + a firm pole plant/punch (don’t be gentle), constant pressure from the heel of the hand into the cradle of the strap and a follow-through push when the hand lines up with the hips. Level 3 is big in Europe, but most Americans don’t want to be bothered. Level three burns over 40% more calories than regular walking. Level 3 requires maximum push and can only be effectively done with real Nordic Ski Walking Straps. Remember the poles are NEVER planted in front of the lead heel unless you are descending a steep hill. The American Nordic Walking System does NOT recommend faking a long stride, and we do NOT recommend leaning forward at any time – especially when going faster. It is all about good biomechanics. 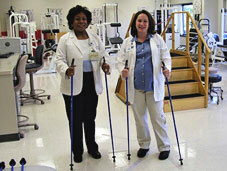 Cheap/flimsy collapsible poles equipped with twist-locks and flip-locks cannot hold up to the stress of Level 3. For use during Physical Therapy, trekking, Nordic Walking, ski racing, Nordic running and for all applications one-piece poles always prove to be safer, stronger, more user-friendly, ….. for all ages and all fitness levels. Over 12 MILLION Europeans are Nordic Walking every day – NO snow and NO skis required! Walking with poles is FUN!